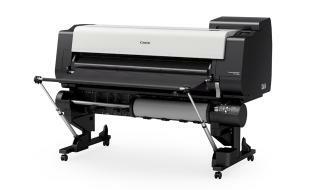 Your compact TX4000 large format ink-jet printer is built for high speed, accurate, yet economical printing up to 44”. Take control from an easy to use touch screen display, print direct from a USB or monitor, switching between media and print sizes as you need, and always know your document is secure thanks to smart data encryption. With the convenience of two media rolls and the smarts to switch from one to the other, your Canon TX 4000 automatically moves from job to job. Working on site? No worries. Your TX 4000 produces accurate graphics with fine detail, on coated and economic uncoated paper every time. Don’t be fooled by the TX 4000’s compact body. This user friendly, dual roll feeding large format printer may be small but it’s a powerful workhorse. You’ll never miss a beat thanks to best in class uptime, a convenient touch screen and tight security to ensure confidential documents never leak. Interested in the Canon iPF TX 4000?